Metaphase focuses on developing products that harness "The Quality of Light" by developing, manufacturing and marketing LED lighting solutions for the machine vision and inspection industries. Metaphase has an ever broadening and expanding product line with over 1000 different specialty lights and power supplies and thousands of installations around the world. Featuring the industry's breakthrough performance line lights for imaging applications requiring ultra-high intensity with unprecedented uniformity: Metaphase line lights. These feature ease of integration and an adjustable lens to emit a narrow beam of light that can be focused from as close as 10mm to up to several meters away. Enhanced cooling options include either integrated fan or Metahpase's new computer controlled micro-flow compressed air thermal control systems. Many lighting requirements today require a rugged waterproof, wash down compatible lighting solution. However tough those requirements may be Metaphase has a lighting solution for you. Metaphase ring lights are specially designed to project an even, 360 degree overlapping ring of light from camera to lens and in most front lighting applications, ring lights are the simplest and lowest cost solution to camera lighting. LED ring lights have become so common in close-up and camera illumination that you may be inclined to think that all ring lights are the same; however each Metaphase ring light was carefully designed for each application. The Metaphase ExoLight™ is the most efficient and economical LED replacement technology available for the fluorescent tube. The Metaphase ExoLight™ is best applied where a highly intense, yet widely diffused light beam is required. 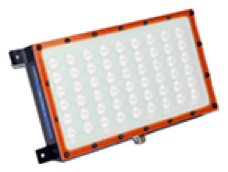 Metaphase ExoLights™ produce whiter, brighter, and flicker-free illumination compared with fluorescent technology, with a 75,000-hour LED lifetime expectancy. Isotropic lensing produces extremely even illumination and eliminates the glare and hot spots inherent in LEDs. The ExoLight™ is "tube-like" in form and mimics the softly diffused output of fluorescent fixtures like no other ordinarily diffused LED fixture can. These fixtures produce higher power and more stable output than fluorescents while featuring the long lifetime expectancy and low cost of ownership of LEDs. R.R.Floody Company is a Metaphase distributor in Northern Illinois, Iowa and Southern Wisconsin. We offer technical support to help our customers solve their applications.